A distinctive feature of CEREBROVITAL® is its composition, which, due to its multimodal actions, provides a maximal effect in improving the clinical symptoms in patients with cerebral, neurological and ophthalmologic abnormalities of vascular origin. CEREBROVITAL® is recommended for prevention and holistic treatment of chronic cerebrovascular disorders and retinopathies of vascular origin. CEREBROVITAL® is the best combination of the standardized extracts of medicinal herbs and lecithin that improves blood supply and microcirculation in the cerebral and ocular vessels, as well as contributes to neuronal nutrition. Ginkgo biloba improves blood circulation in the healthy areas of the brain and areas with an insufficient oxygen supply, which stimulates the memory and brain activity. Prevents neuronal damage, improves metabolic processes, as well as prevents blood clotting. Gotu kola has a stimulating effect on the cerebral cortex, restores damaged nerve fibers, and improves venous and capillary blood circulation. Along with the activation of brain activity, Gotu Kola reduces anxiety and has a sedative effect. Lecithin ensures neuronal nutrition, contributes to the recovery of neurons, improves nerve conduction, and prevents the formation of atherosclerotic plaques. NUTRITIONAL AND ENERGY VALUE (CALORIC VALUE) PER 100 g OF THE DIETARY SUPPLEMENT: proteins – 15.0 g, carbohydrates – 1.1 g, fats – 0 g; 64.4 kcal (296 kJ). 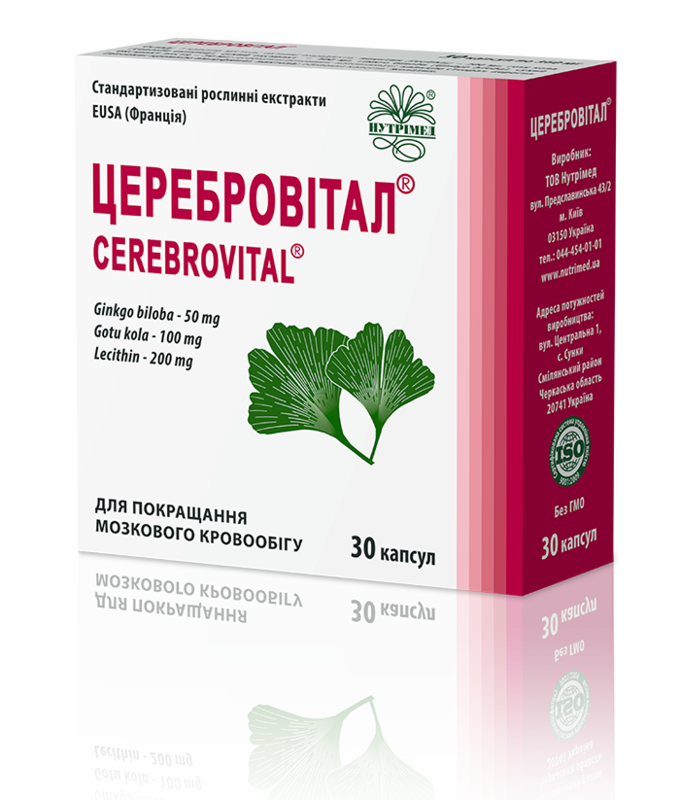 RECOMMENDATIONS FOR USE: CEREBROVITAL® is recommended as an additional source of ginkgolides, flavone glycosides and lecithin to improve cerebral and peripheral blood circulation, enhance mental and physical performance, improve memory and concentration power, prevent cerebrovascular disorders, including those associated with the age-related changes. METHOD OF ADMINISTRATION AND RECOMMENDED DAILY DOSE: adults should take 1 capsule 2 times daily after meals swallowed with plenty of drinking water. The treatment course is 2-3 months. The course can be repeated if needed. CONTRAINDICATIONS: individual intolerance of the ingredients, pregnancy and lactation. STORAGE CONDITIONS: store in the manufacturer’s package in a dry place protected from light, out of reach of children at temperatures below 25°С.